To say that the internet plays a big part in my life is an understatement: the internet is my life. My full-time work is online, my projects on the side are all online, more than half of my siblings are overseas so we keep in touch online, I share my travels through this blog, which is of course, online. I’ve experienced the slowest of slow connections: our first modem was a 1400 baud dial-up modem. I’ve experienced fast: 24 Mbps in Hong Kong. Last weekend, I experienced holy-frack-that’s-fast! : download speeds of up to 50 Mbps using Smart LTE. 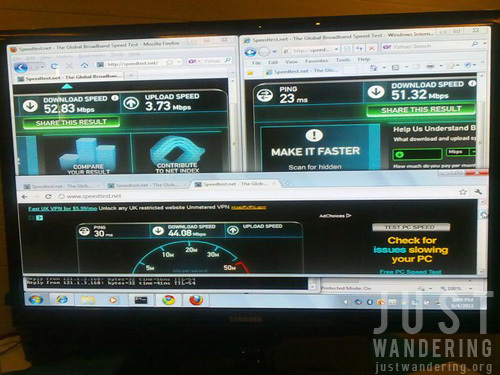 So what does fast internet have to do with travel? A lot, actually. If you’re like me who is dependent on the internet, you’d have spent a fraction of your trip (and a small fortune) sitting in front of a computer, updating your blog, your Facebook and your family about your whereabouts; reading and replying to e-mail sent by friends or clients (and prospective clients); catching up on what’s happening in the world you left behind. Minutes that stretched into hours are spent staring at the monitor waiting for that ridiculously huge attachment to download so you can review and reply while you wait for photos to upload at a snail’s pace in the next tab. Having a fast internet connection means more time to enjoy paradise. It means more time to spend with friends. Didn’t know you can lie down in the paraw. Must do this more often in Boracay. 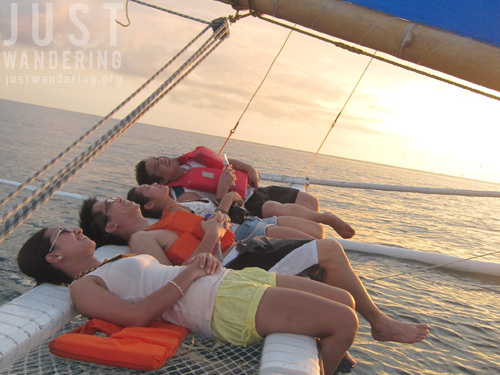 …while you ride a paraw as the sun sets. 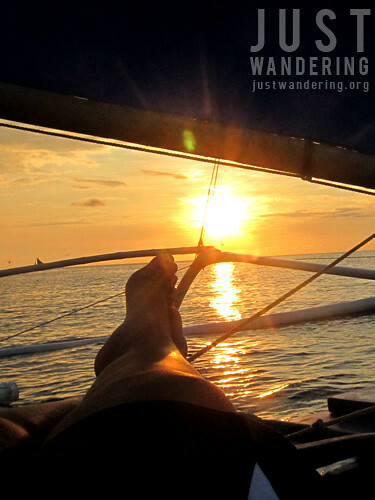 While you can argue that traveling means disconnecting from the online world, it’s unfortunately, not an option for me. As much as I love the time I get to spend away from the computer, I still get the nagging feeling at the back of my head that I have to check my e-mail; to ensure that everything is in order. My work is online: the internet is open 24/7. There are no weekends or holidays. That’s why even if I don’t want to go online, I have to because I have to keep my clients happy. Though my work is actually mobile — I can work anywhere in the world as long as I have internet connection — I am hesitant to on this route because I don’t just require an internet connection. I need fast and reliable internet connection. Unfortunately, that’s a bit of a problem in the Philippines. So I opt to stay at home, tethered to my DSL, dreaming of the day I can pack up and travel long term around the country, without having to worry about rushing back to Manila to work. Smart LTE is 4G, which requires a completely different infrastructure as the current 3G standard. While this means it would take some time before we start enjoying super fast internet across the Philippines, they’re aiming to roll out the service to major urban centers at the end of 2011 or early 2012. Until then, I’ll start preparing for that day when I can finally break free of my DSL dependence and can rely on stable mobile internet as I perfect the art of slow travel*. * staying in one city long enough to unpack, create a routine, become a regular at a cafe, etc. baka naman mabilis kasi konti pa lang gumagamit. thanks for your honesty and writing that this is a paid advertorial. what does that mean? they paid for you to write this or they paid for your airfare and accommodation? kasi marketman raised quite a fuss about paid blogging. but from what i understand, you’re not forced to write a favorable review right? Albert, it was an all expense paid trip and I got a little extra too, for featuring them in the blog. No, there is no pressure to write a positive review. I wouldn’t accept it if that was the condition. What I wrote here is based on my experience last weekend. Yes, there’s a huge possibility that the speed would taper once it goes commercial, but this is going to be a premium service, so I don’t think it’d be as congested as the current Smart Bro network. 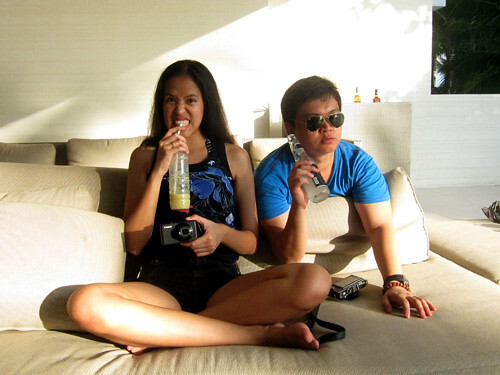 We were in Boracay last June 1-4, 2011. I was so happy cause the weather las week was really great! Now I know why there were a lot of Smart sponsored Life guard house in Boracay from station 1-3. The weather really cooperated last week, no? They’re all over the Caticlan jetty port too! Really enjoyed the trip despite the fact na overnight lang siya. 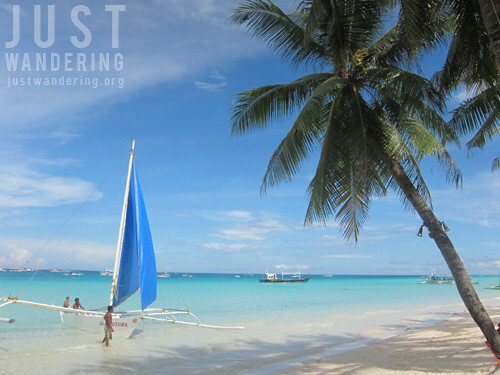 Fast internet connection + Awesome Company + Clean Beach + Good Food + Rice Weather = Paradise <3 Thanks for the photos, Nina! Rice weather? Gutom ka Mica? Wag kalimutan ang shake na super effort puntahan! Anyway, same with me, I can’t live without my computer and Internet connection. I might try the Smart LTE when I get back to Cebu. Thanks. Thanks for the article. I am excited for this new service since our company just rolled out a new online system. If this Smart LTE lives up to its commitment, I can opt to work mobile. Cool! Interesting article. 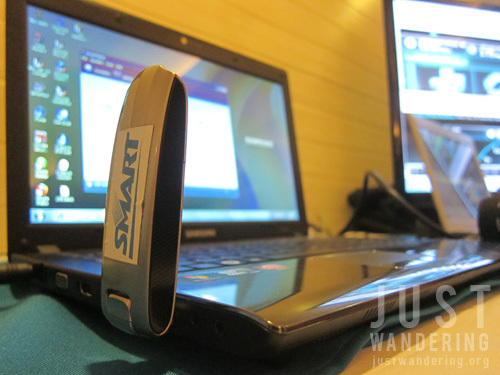 So Smart has a new internet service. Right now, I have the Smart Bro and sometimes it’s good, some times not. On another note, I find your blog quite interesting. I’ve been some places too. Admittedly, I haven’t had much time to write about it even if I want to. I do have a blog…still relatively new, and still getting the hang of it. You may check it out if you wish…but don’t expect too much. Hee-hee! i think your work is ideal.. that it allows you to travel as much as you do! how many hours would you say you keep in front of the internet? As for sponsored: do you only go to places you’re NOT interested in? Why would I visit places I’m not interested in? do u have any idea when it will be available in Boracay?